Yaomatsu Restaurant (八百松楼) in Mukojima (向島), Tokyo. The photographer probably stood on the Makurabashi Bridge (枕橋). The ferry left here for Asakusa (浅草) across the Sumidagawa River (隅田川). 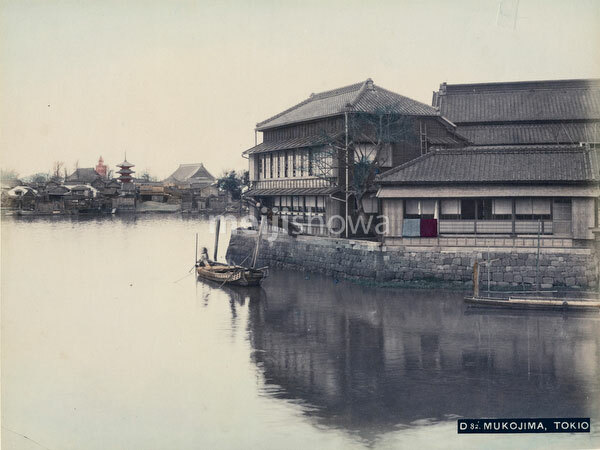 The main temple and pagoda of Sensoji (浅草寺) are visible, as well as Ryounkaku (凌雲閣), which was built in 1890 (Meiji 23), dating this image to the 1890s.